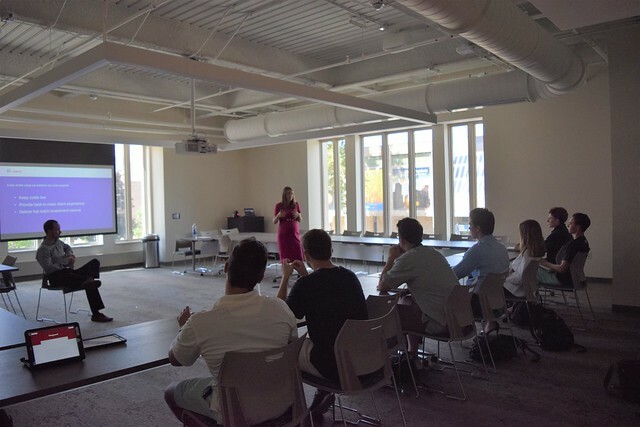 On Sept. 5, Molly Concannon and Ben Rost of The Vanguard Group hosted “A Day in the Life of a Buy Side Trader.” The event was the first pop-up workshop of the new school year, a series of programs designed to inform Notre Dame students of the different career paths within the finance industry. Concannon and Rost both focused the discussion around their work with fixed income trading, how Vanguard’s core purpose—‘to take a stand for all investors, to treat them fairly, and to give them the best chance for investment success’—ties in directly to their work, and provided a glimpse into marketing this approach with institutional clients. Molly Concannon is a buy-side trader at The Vanguard Group (Vanguard). She began working for the investment company through a summer internship program while she was a student at Notre Dame. Upon earning her BBA from the University in 2010 in Finance, Concannon accepted a full-time position at Vanguard, where she worked in a variety of roles, including the Corporate Strategy Department and Corporate Finance. She also worked as a trader on Vanguard’s index, derivatives, and FX desks. She left the firm briefly to earn her MBA from the London Business School before returning to Vanguard as a fixed income trader which is the position she holds today. Ben Rost is the Defined Contribution Advisory Services Methodology Lead, where he collaborates with a team of investment strategists to deliver insights to over 500 401(k) plan sponsors each year. Previously, he was a senior manager in Vanguard Portfolio Review Department, where he led product management for Vanguard's bond index funds and ETFs, and product development for Vanguard’s mutual funds. Mr. Rost joined Vanguard in 2004 and has held a variety of financial sales and client service roles. He served as an investment analyst in Vanguard Portfolio Review Department and a project manager in Vanguard Corporate Strategy Group. Before Vanguard, he was a commissioned officer in the U.S. Army. Mr. Rost earned his B.A. from the University of Notre Dame and his M.B.A. from Villanova University. Founded in 1975, Vanguard is an asset management firm headquartered in Valley Forge, Pennsylvania. With over 5 trillion dollars in assets and 20 million clients across the globe, it is one of the largest investment companies in the world. Vanguard manages accounts for individual investors as well as institutional and financial advisors, always with the intent of keeping costs low, providing best-in-class client experience, and delivering top-notch investment returns. A fixed income trader trades investments like, public company debts, tax exempt municipal bonds, and/or government debt. A buy-side trader, like Concannon, works on behalf of her clients, individuals and institutions that are invested in Vanguard’s mutual funds or ETFs, to identify investment opportunities she and her team believes will outperform the funds’ benchmark. They do this, by assessing the credit-worthiness of different companies and ultimately deciding to whom they should lend money (i.e., buy a bond). This is opposed to the sell-side traders, who manage the creation, promotion, and selling of traded securities to the public. Sell-side traders serve as client advisors through pitching stocks and opportunities that may be enticing to their investors. The products that they produce are then made available to the buy-side traders. Concannon’s daily routine begins when she arrives at work as she immediately begins reviewing what happened in the market overnight. Through collaboration with the sell-side traders, a cohort that she regards as “critical partners of [buy-side traders],” Concannon can quickly assess any new information and start working to see what new deals will be initiated, focusing on her end goal of making the best buy recommendation.